Smithfield Pediatrics is pleased to welcome Jennifer M. Barton, PA-C, now accepting new patients. Please call 401-231-3138 for new patient appointments. 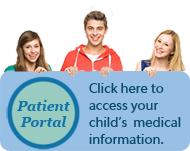 Effective April 1st, 2017, if you have a high deductible insurance plan, Smithfield Pediatrics will need to have a credit card on file for your family in an effort to improve the payment process. As of October 15th, 2016 we are no longer accepting Neighborhood Health Plan of Rhode Island. Please visit the Department of Health website at http://www.health.ri.gov/flu/ for more information about Flu.